The second recipe i did from Greek cuisine is this revithia/chickpea soup. Soups and salads are my go to options during weekdays, mainly for dinner. So, i m always happy to find varieties for our dinner meal. 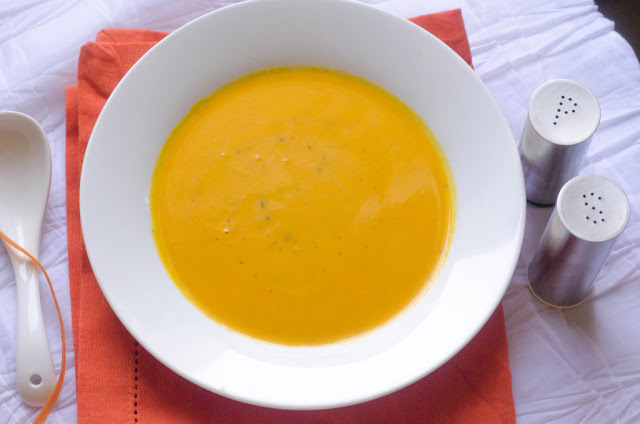 This soup has very less ingredients, no fancy sauces or dressing. That is the main reason i chose this soup, when i checked the recipe, there was no heat in the recipe, i was a little skeptical,whether it will be good just with oregano and fresh herbs. But trust me, it tastes amazing. 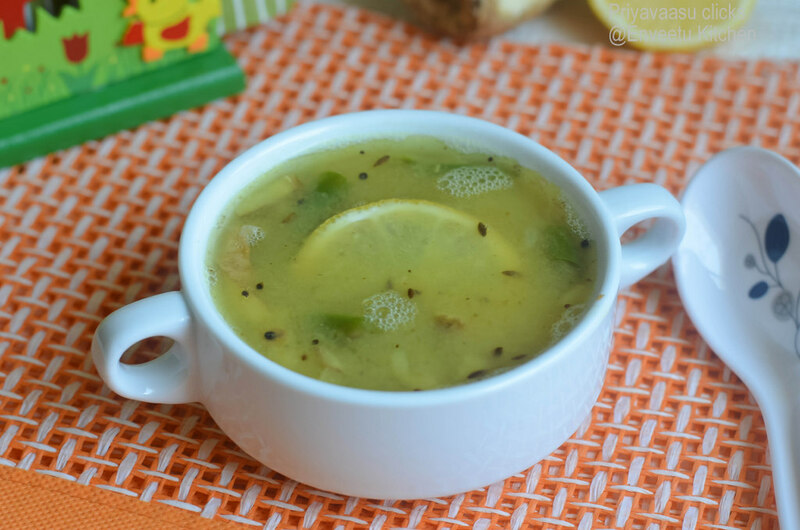 The addition of lime juice and a dash of pepper takes the soup to another level. Add herbs at the end to enjoy the freshness. 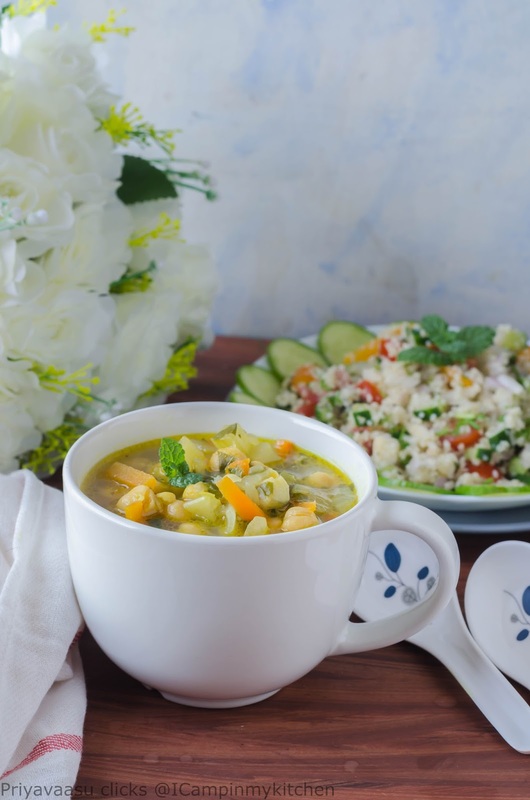 I served this soup and Bulgur salad for dinner last week and we enjoyed both, what we missed was a slice of crusty bread, if you can pair with some delicious toast then it will be a complete meal. If using dried chickpeas, then soak it for atleast 6-8 hours and cook it with double the amount of water until soft. Since i used canned chickpeas, i skipped the step. If using canned like me, then drain the liquid, wash the chickpeas in running water and set aside. Now let us the get the veggies ready, chop the onions fine, chop celery and carrots into small cubes or thin strips. Heat a sauce-pan with oil, add chopped onions, bay leaf to it. Saute until onions get translucent. Next add chopped celery and carrots. Add 1/4 cup of water and let this cook for 5 minutes. Now add drained chickpeas to this and 2 cups of water. Add salt and oregano and let it come to boil and cook for 10-12 minutes. 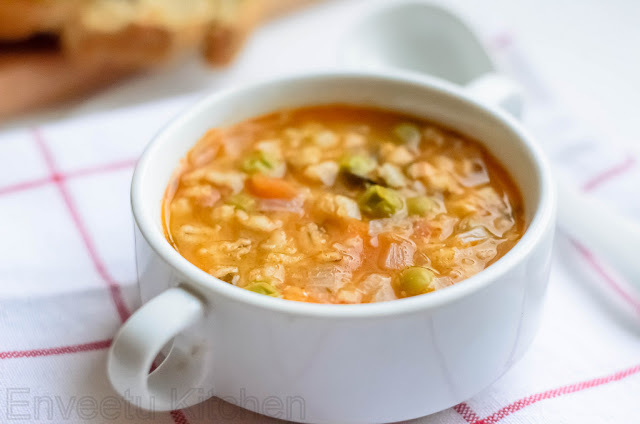 Check the consistency of the soup, it is generally a bit runny, if you prefer it to be little thick, then mix flour and soup liquid and make a slurry and add this in thin stream to the soup,mix well and let it cook for another 8-10 minutes. Before removing from heat, add chopped herbs, lime juice to the soup, take it off and let it sit for 5 minutes for the herbs to mingle well. Serve it hot with a dash of pepper on top. Looks so inviting Priya..awesome setup..I was sort of pinning on this recipe,now all your dishes have made me go for this! Even i prepared the same soup and loved it to the core. Beautiful bowl there. That is one hearty bowl of soup, Priya. Sometimes the non spicy ones take us by surprise! 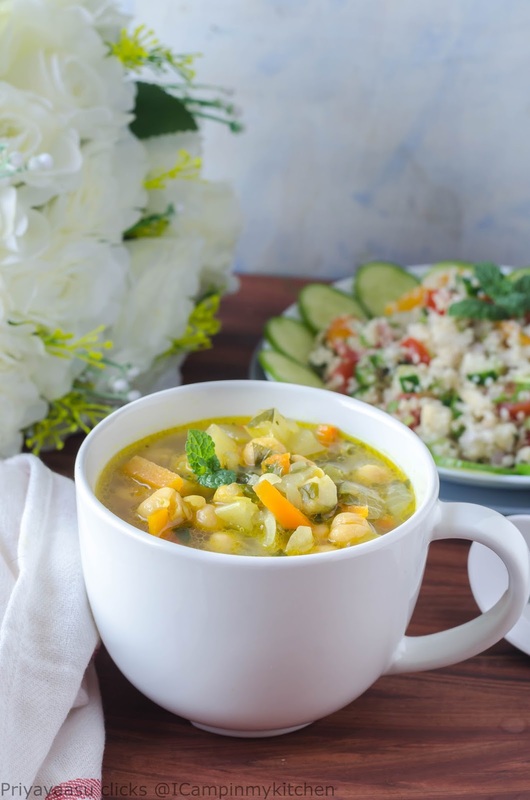 I have tried a chick pea soup some time back and loved it. This Greek version too sounds so filling and delicious..
That is such a hearty and easy to make chickpea soup. Really new for me. I think this is perfect for the weather here. Except celery I get everything. Will make this soon. thank you Priya for a wonderful collection of soup recipes. I will be visiting often. This is perfect for the season, would love to try it sometime. Thanks for sharing. 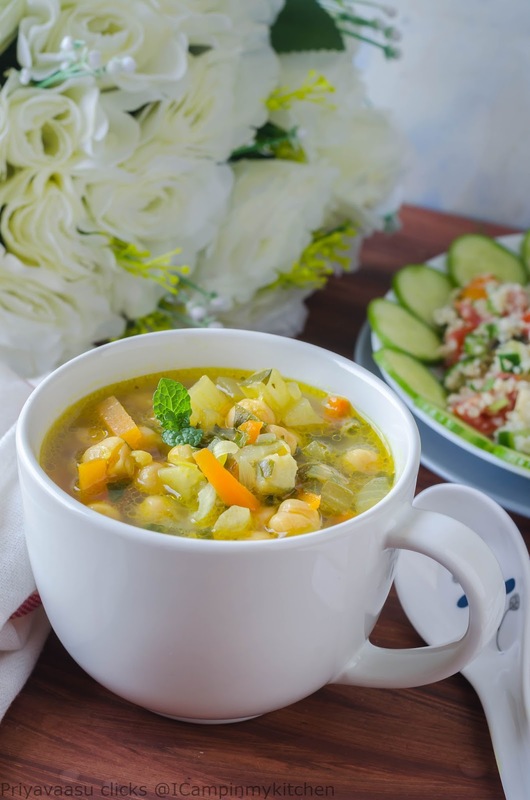 I love the Greek flavors and this soup looks so filling and tasty. 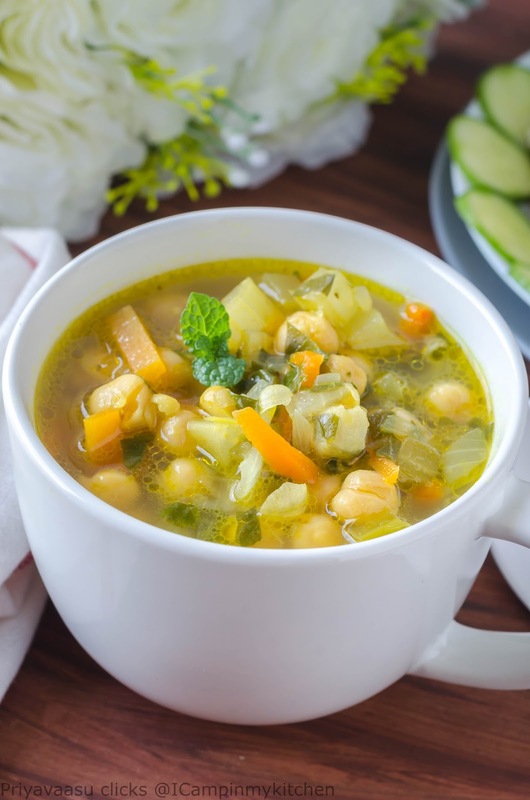 Always looking out for hearty soup recipes and this one looks delicious.